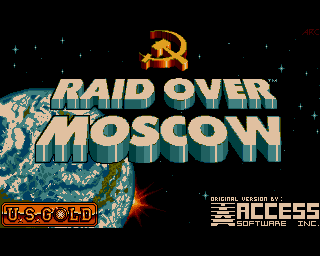 Created by Bruce Carver for Access Software and published by U.S. Gold 1984-85, Raid over Moscow is full blown multi-action game that combines smooth graphics, great sound effect and quite a good story line. 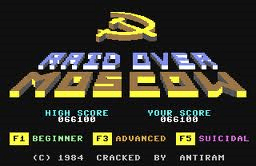 Your role in the game places you in the Cold War era as an American Space Pilot that has to try and stop three Soviet nuclear attacks on North America, you then proceed to fight your way into and destroy a nuclear facility located in Moscow‘s Kremlin. 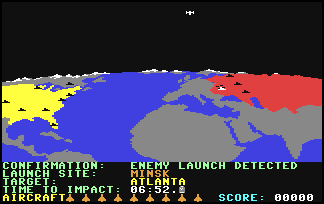 The opening scene to the game shows an overview of earth from space from aboard the Strategic Air Command, this facility is used to alert U.S. Commanders of any nuclear activity. Once a Soviet launch has occurred the computer will identify the launch site showing the launched missiles and time to impact. 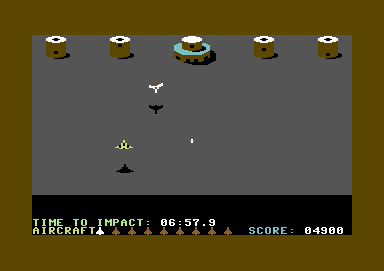 The missiles are identifiable as small dots on the screen heading towards the U.S. Luckily the Space Station is equipped with nine Stealth Fighters that you can use to engage and destroy the enemy. Once inside the Space Station, a fighter pilot will walk towards and enter his aircraft. Each pilot must then take his aircraft out of the station, this can be quite difficult because as you are in outer-space the aircraft is moving in a semi-weightless condition making it tricky to fly. 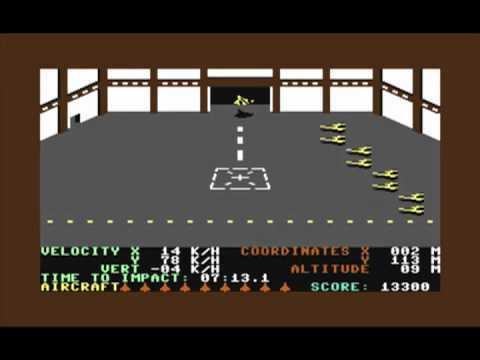 Your craft is controlled by three thrusters, forward, left and right, your aim is to take each one safely through the bay doors and out of the hanger. How you proceed in this part of the game is totally up to you. You can take all of your craft out of the hanger and into space, or just one at a time before proceeding to earth to the attack point for an attack run. The advantage of taking more out is that if you lose one then you will not have to go back to Space Station hanger to get another. However taking more craft from the Space Station costs time and you may not need them all to complete your mission. From the overview you can then guide your craft to the white area where the missiles were launched to engage the attack run. 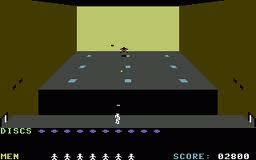 This part of the game has a bit of a Zaxxon feel about it. Here you must fly your craft across the vast launch site destroying as much as you can along the way, preferably at low level to avoid being picked up by radar. Here you will encounter heat seeking missiles, tanks and other military vehicles, buildings, silos and helicopters that will try and shoot you down. Once you have successfully completed your run you are presented with a bunch of missile silos to destroy, one main control silo surrounded by four launch silos. If you destroy one of these silos you will be awarded an extra aircraft (nine maximum). At this point you need to pay attention to the ‘Time of Impact’ indicator on the control panel, if you think you to have time you can try and take out all the silos, if you manage this you will earn extra points. If you feel that you don’t have enough time its the control silo you need to take out as this is where the nuclear missiles are controlled from. Each silo has a small window which you must line up your ship and fire a missile to destroy it, your ship will turn blue once you are on target. To spice thing up a little, your ship will be fired upon from the silos and from an enemy craft that will try to home in on you to make your task of destroying these silos a little bit more difficult. Once all three launch sites are destroyed you can proceed to the Defence Centre. In this part of the game you actually feel as though your getting towards the end of your mission. Armed with a Rocket Launcher, in a trench with only a wall in front of you for protection you are presented with plenty of targets to fire upon. You’ve got eight soldiers, four either side of you on high walls that take pot shots at you which you have to shoot. If you take to long, these will reappear and carry on shooting at you. Whilst doing this a tank will come from the side doors and try to line up with you so it can shot and try and kill you so don’t stay in one place to long or your dead!. The white turrets on the building can be take down for extra points if you fell brave enough. Its then onto shooting the five doors on the front of the building. When these doors are hit they will turn red, only one will turn white and this is the door to final chapter, the Reactor Room. On entering the Reactor Room you will see a robot, it will automatically recognize your presents and try to defend itself by shooting at you. The robots job is to move around the room placing itself over cells in the floor. It will then inject coolant into them to keep the reactor temperature stable. Your mission is to interrupt this process by hitting the robot with grenade discs and gradually make the system overheat and reach critical mass. To do this you are armed with a laser sight and number of grenades discs. The laser can be seen as a black spot on the rear wall. The aim is to throw the grenades like a discus and make it bounce of the wall and hit the rear of the robot, this is its Achilles heel. Continually doing this process will eventually destroy the robot. Getting the right angle and timing your shots correctly will be critical if you are to succeed. 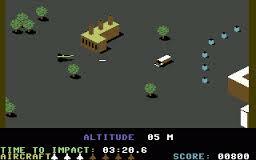 This end scene shows the Soviet Defence Centre in Moscow being blown up and you flying away in your aircraft having completed your mission. 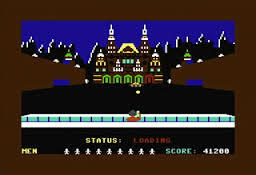 This game became famous in Finland due to the political effect of its content. A leftist member of the Finnish parliament went as far as to make a parliamentary question about whether it was acceptable to sell the game. The resulting debate and publicity actually made the game a top seller in the country. I also love to see games like this resurrected. A remake for the game that took some six years to make was finally completed in 2008. 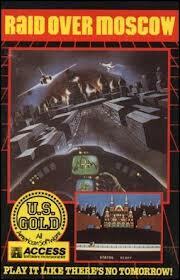 Written by Andrew Layden and called ‘YF-23 Raid over Moscow’ a full version of the game is available to download free on the PC. What you waiting for !